Dell EMC provides the essential infrastructure for organizations to build their digital future, transform IT and protect their most important asset, information. Dell EMC enables our enterprise customers’ IT and digital business transformation through trusted hybrid cloud and big-data solutions, built upon a modern data center infrastructure that incorporates industry-leading converged infrastructure, servers, storage, and cybersecurity technologies. 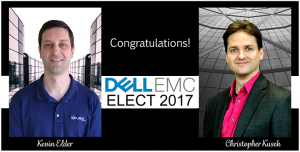 With only 157 Dell EMC Elect designees worldwide, we are honored to have TWO such designated Engineers on staff here at Xiologix. We would be happy to help you navigate the myriad of options available to you and help guide you towards the ideal solution for your infrastructure needs.